Finances are fundamental to running a successful business. No matter whether you love finances or hate them, you have to take care of them. Not taking care of your finances can only result in one outcome: Losing money! When most people think of financial goals they think of revenue projections. I made $335,000 this year and plan to make $400,000 next year. But there are lots of other "basic" finances you need to set goals for. Here are a few thoughts. Okay. You need to have revenue projections. They need to be realistic. And you need to look at them often enough to KNOW them so you can reach them. After all, if you don't your goal for the month or the year, how could you possibly reach it except by accident? Now we're talking money! Revenue is good, but profit is better. If you make $500,000 in revenue and only $100,000 in profit, that's worse that earning $350,000 and making $100,000 profit. The reason is simple: It takes a lot more work to earn that $500,000. You should have profit goals for each month and for the year. Your profit margin is literally the connection between Revenue and Profit. You should have specific goals for each broad category of what you sell: Products, labor, services, etc. Everyone has different recommendations for these goals. You need to set these goals yourself, but consider the following as a starting point. In my opinion, hardware and software should have a profit margin of 20%. Labor should be more like 40%. With managed services, you might push labor to 50%. Services can be all over the map. For cloud services, we start with a 100% markup, which gives us a minimum of 50% profit margin. If you are providing a backup service, you can combine the service with your labor and maintenance for one price. If you do that, be sure to track the cost of service and related labor under "cost of goods sold" so that you calculate the profit margin. EBITDA is "Earnings before interest, taxes, dividends, and amortization." 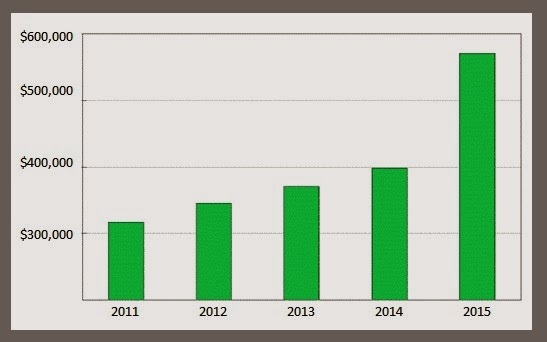 For most small businesses, this is almost identical to net operating profit. Work with your accountant to verify the items you need to back out of your calculations (such as tax payments made) to calculate EBITDA from profit. But here's the bottom line, so to speak. Your EBITDA Percentage should be a minimum of 8-10%. That is absolute minimum. It could easily get to 15% or even 20% or more. If you can't sustain eight percent, take your money out of your business and put it into the stock market. That will give you an average return around 8%. All of those numbers should be tracked monthly, in your PSA, QuickBooks, or both. I like to put all of that into a single Excel workbook so that I can track the "Year to Date" information. Sometimes you'll invoice a client in one month and then end up ordering the equipment (incurring the expense) in the next month. As a result, the first month will look more profitable than it should and the next month will look less profitable than it should. But the year to date stats will be correct after the 2nd month. Anyway, you should have monthly targets for revenue and profit, primarily. Everything else flows from that. I recommend looking at your finance AT LEAST once a month. Ideally, you should do it every week on the same day. That gives you a good sense of how money flows in and out of your company. As the year moves along, you should have two sets of numbers: The real numbers for months past and the projected numbers for the months ahead. And of course you'll have a final tally for the end of the year. As the year progresses, each month will move from "projected" to "actual" and your projection for the whole year will become clearer and clearer. I know this sounds like a lot for the basics, but once you begin looking at these numbers all the time, it will be very easy to understand at a glance and won't take more time. One of my favorite maxims of success is that you get better at whatever you put your attention on. If you put your attention on your finances, you will make more money. It just is true. And once you have goals for each month and the year as a whole, you can reach them as well. In a couple of weeks we'll talk about realistic revenue projections. For now, work on making sure you have a grasp of the basics. There are two primary times when an MSP will work from home. The first is when you have no other office. This might be because you're just starting out, you have no employees, or your employees/contractors also work at home. The second is when you get larger and choose to work at home in order to increase productivity or work on special projects. Or you might be an employee working from home for the same reasons. In either case, here are some tips for working at home in order to be as productive as possible. The first thing you need to do if you're working at home is to set up an actual office - a place to work. 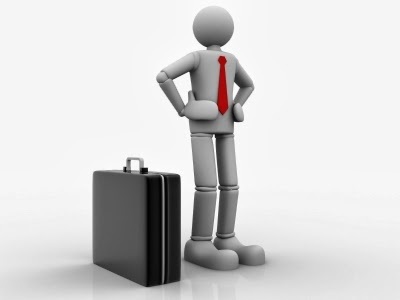 When I first started my business, I was worried about taking the home office deduction. My accountant looked at my office and said I had nothing to worry about. The reason was simple: That room was filled with work things - a long table for building PCs, a desk, shelves full of computer books, and a file cabinet. It was obviously an office and not a bedroom. Tax considerations aside, your home office should be designed and organized to be as productive as possible. That means you need a good desk, a good chair, a good PC, a good phone, etc. You need all the office basics so that you don't spend your home office time running to Staples or Kinkos. Good furniture will also allow you to be comfortable, which will improve productivity. Your home office should also have clear boundaries. Even if you have to set up shop in the family room or kitchen (not recommended), you need to have a place that is "yours" and off limits to the rest of the family. this also helps you set the interruption boundaries discussed below. Even if you're the "messy desk" type, your home office desk should have a nice clear area to get work done. Again, the goal is to create a productive environment. 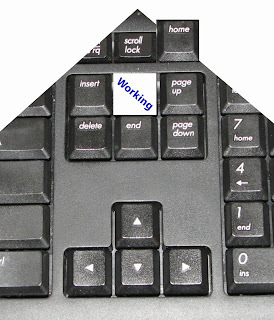 There are two sets of work habits related to working at home successfully. The first has to do with the "home" part of the equation. The second are rules you should follow at the office and keep following when you work from home. Perhaps the most important habit for working at home is to pretend you're at the office. That means you dress for work. Even though we joke about working in your pajamas, don't do it. Put on your uniform - a nice pair of pants and a business casual shirt. Dressing for work puts you in the right mind set. That's huge for developing the self discipline you need to work from home. It is also important to set work hours and take them seriously. The flexibility of working from home means that you might start a little later or earlier than normal. But whatever hours you set, stick to them! 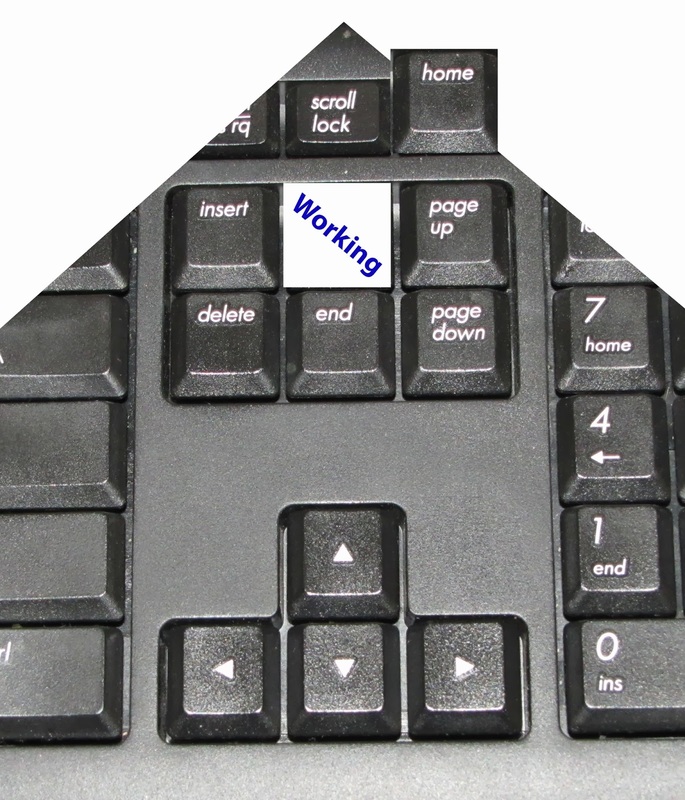 Pretend you are clocking in and clocking out. In between is work. When you work, work. No visits to the kitchen. No TV. No chores. No "home" paperwork. These can be big temptations, especially if that desk is the same place you work on home finances. You need your family to support your home work limits. That means they can't interrupt you at your home office any more than they interrupt you at your other office. You might accomplish this by closing the door, setting out orange cones, or putting up a sign. Whatever works for you is fine. This can be very difficult, but you need to be diligent enforcing this. It will take time for the family to get used to this, but they will. - No interruptions during working hours! Do not be interrupt-driven. Focus on what you're doing. Do it well, then move to the next task. - Take breaks. You simply cannot work eight hours straight without a break. If you do, you will find that you are less productive. Take a break or two in the morning and at least two in the afternoon. And of course you should stop for lunch. This is the only time you can violate the "no kitchen" rule. Be sure to keep the breaks to 5-10 minutes and lunch to an hour. Don't get side tracked with a television show, video game, etc. For my breaks, I stand up and listen to one or two songs on the stereo. That's at least five minutes. It gets my circulation going, and then I return to work refreshed. - Check out at 5PM and stop working! - Track your time completely and accurately. That means you need to track what you're doing from 8AM to 5PM (or whatever your hours are). If you have a PSA, use it from home. There's no excuse to stop using your PSA to enter time just because you are at home. One final note. If you do have employees or contractors you need to work with, you need to make time to actually meet with them. Totally virtual businesses are hard to maintain. Some human contact is needed. When I started having employees, I had them come to my house. But that quickly became inconvenient for everyone. So I scheduled meetings at local coffee shops or restaurants. That worked much better. And, of course, when that didn't work anymore it was because we really did need to get an office. When employees work from home they need to understand that this is a privilege that is granted with the understanding that they will be as productive at home as they are at work. Having a PSA makes this much easier to manage. But no matter how your company is organized, home workers need to produce the same results as they would in the office. For many companies, allowing employees to work from home builds a stronger team. It shows you trust them, it reduced their commute, and it shows that the company is flexible. It also allows employees to take care of sick kids or other family matters while still getting their work done. That kind work/life balance is good for everyone. I cannot explain why Yahoo stopped letting employees work from home. Done right it is one of the best things you can do for your company. 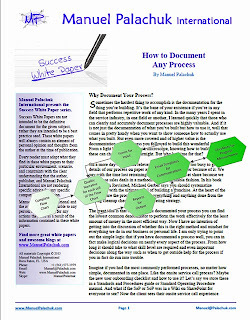 The newest paper is How to Document Any Process. If there's one thing Manuel does well, it's process improvement. The first thing you need to do with any process improvement is to document where you are. Then you can document the process you want to create. Sometimes the hardest thing to accomplish is the documentation for the thing you’re building. From a light bulb to an electron microscope, knowing how to build one of these can change a nation overnight. But who has time for that? Imagine if you had the most commonly performed processes, no matter how simple, documented in one place. Like the onsite service call process or maybe the new user onboarding checklist and how to use it. Let’s say we store these in a Standards and Procedures guide or Standard Operating Procedure manual. 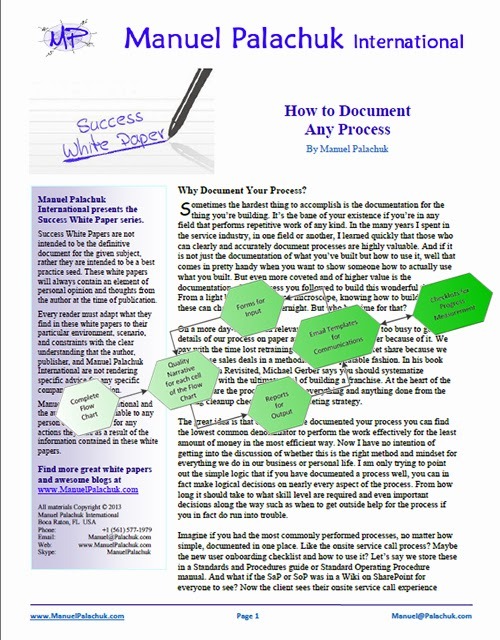 In this white paper, you’ll learn how to document any process step by step, and you will learn to master the critical elements that make up a complete process document. Along the way, you will pick up some of the best tricks to collaborating online. With your team focusing on continuous incremental improvement through collaboration, you can build and document the most important processes without having to spend a lot of time in meetings. This product is delivered electronically as a pdf. Find out more. Or just order now. 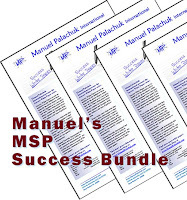 Now Five Great White Papers by Manuel Palachuk - only $69.95 ! To be successful you must have good people and good processes. 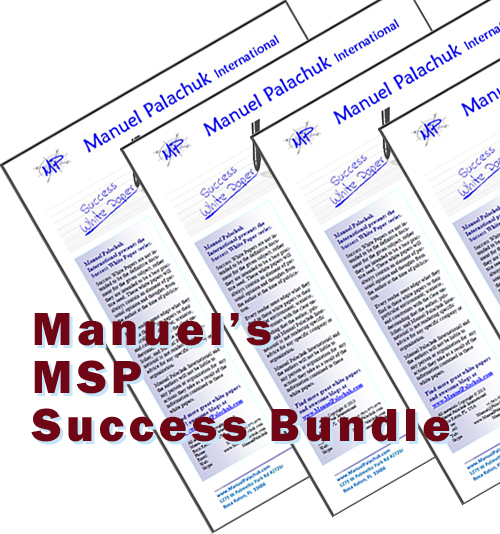 This bundle of five white papers provides some great "Best Practices" to organize and run you MSP business successfully. Written by a proven successful consultant and coach with more than twenty years of experience designing and implementing process improvements in dozens of businesses. Separately, these papers cost $129.75. In the bundle you get all four for only $69.95! Find out more about the bundle. Or just order the bundle now. I am proud to announce a new year-long program for Managed Service Providers who want concrete, realistic action steps to take their business to the next level. Each Great Little Seminar is a focused class that last five weeks. That timing allows you to absorb the material, design an action plan, begin implementing changes to your business, and get feedback from the Instructor during the whole process. These are practical courses. If you apply what you learn, you save or make the price of the class before the five weeks are up. And after that, your business will make - and save - a lot more money going forward. As always, your satisfaction is guaranteed. The first course is Core Standard Operating Procedures for Small IT Providers. This course will cover the most important procedures you need to have in place to run an efficient and highly profitable Managed Services Business. When I take on new coaching clients, they have many of the same issues over and over again. And almost all of them boil down to SOPs - Standard Operating Procedures. Or the lack thereof. Everyone knows you need SOPs. In fact you probably who which ones you need. But where do you start? It's Always Easier to Keep Up Than It Is To Catch Up! I am VERY pleased to announce a series of classes designed to help MSPs of all sizes improve your business, make more money, and reach your goals. Right now we have defined eight classes. Each class will be for five weeks, which allows us to work at a much higher level than a simple one-hour webinar. It also allows the instructor to assign some "homework." 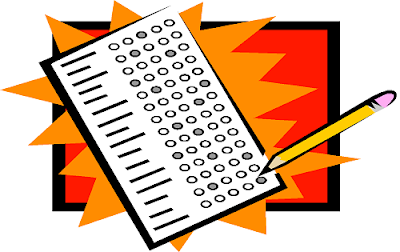 You are not required to complete the homework, of course, but you'll get feedback and advice from the instructor if you do. As with everything else in life, the more you dive it, the more valuable it will be. 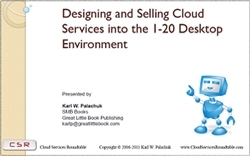 This course is a great introduction to the series. It will be repeated in February of 2014. But you need to note two things about that. First - If you sign up for the class in 2013, the price is only $149. The February class will be at the regular price of $199. The two classes will be identical, but the first one is being offered at an "introductory rate" for the series. Second, if you attend the November/December class, you will be allowed to sit in on the repeat class in February for free. So if you want to go through the material again - or just gain access to me for feedback again - then you can do so at no additional charge. Check it out. Let me know if you have any questions. And Join us in November! This is the announcement for the big SMB Preday show coming up next week. Again, lots of in-bound links. We'll see if traffic for this diminishes next month. I'm not sure why these "milestone" blog posts get any traffic. There's actually nothing here except a note that says Wow. This is the biggest post of the last year. And that makes sense given the impact the announcement had in the small business I.T. space. Traffic is slowing a little, but there are still lots of in-bound links. A recent post. Also a post that was requested by a reader. Obviously, there was interest in this topic. After more than a year, this one is a clear favorite. This post continues to get more traffic all the time. A recent post, which gives it an advantage on this list. But also a very popular topic. I think this one will stay on the list for a while. Now a year old, this post covers one of the most important topics for any business. Organizing your electronic files is critical. Duplicate files and time spent looking for data you know you have are big resource-wasters. This article has become a consistent favorite. Now in it's second year "on the charts." This is one of the most critical elements of a profitable service business. Where do you put DNS and DHCP? Another topic that remains very popular. As always, the SOP (standard operating procedure) Friday series dominates the list. Sometimes it's hard for "old favorites" to be eclipsed, like the "Death of SBS" posting. I may have to report the top posts other than the perennial favorites just because they have so many in-bound links.